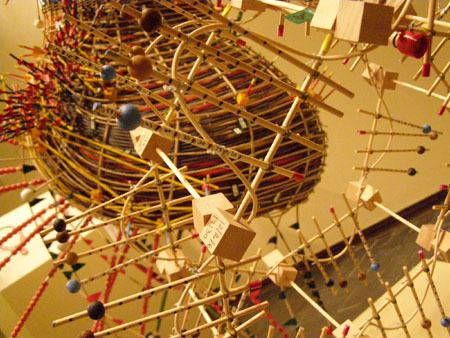 This month, Jan Johnson (Drawing Fellow ’10) is one of the artists exhibiting at the A.I.R. Gallery in Brooklyn, NY in A woman’s work is never done. The show, curated by Susanne Altmann, includes work by women artists that focuses on diverse artistic approaches and blends “the personally meaningful with a close and objective eye toward cultural observation” (read more). 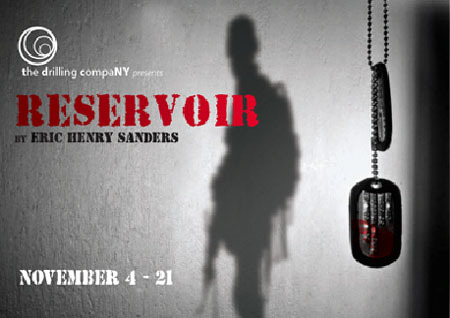 The show runs through January 30, 2011. 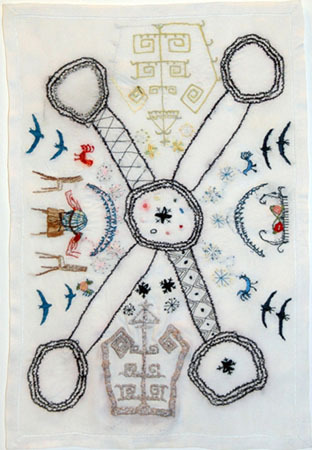 Jan’s recent work (see above) are drawings made with needle and thread, sometimes incorporating found and mixed media elements. It’s fascinating work. You can see images of the A.I.R. exhibition, including Jan’s work, on A.I.R. Gallery’s Facebook page. Last week I went to the Fuller Craft Museum in Brockton and had so much fun! I discovered one artist in particular I’m excited to have found and I’d like to share her with you. 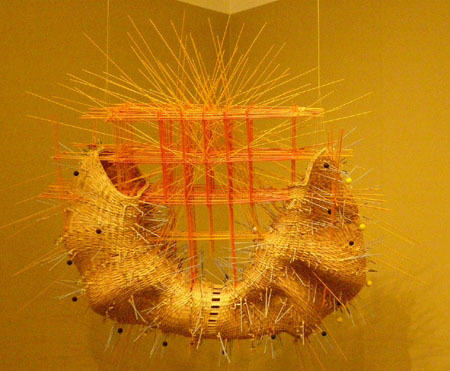 Sculptor Nathalie Miebach compiles the data of tides, temperature, winds, moon phases and other specifics of various environments and creates sculptures made of “reed, wood, data”. She had two pieces in one of the current exhibits at Fuller, The New Materiality: Digital Dialogues at the Boundaries of Contemporary Craft. Along with showing in The New Materiality, Nathalie has a new solo exhibition opening at the Fuller this month: Changing Waters, Nathalie’s largest installation to date. It will be on exhibit January 15, 2011 – September 25, 2011, with an opening reception February 27, 2011, 2-5 PM. Woyzeck, Georg Büchner’s 1837 play about a soldier driven to madness and murder by poverty, exploitation and jealousy, is sometimes considered the first modern tragedy and is a primary source of absurdist theater… Reservoir, a timely, urgent reimagining, smartly written by Eric Henry Sanders and presented by the Drilling Company, tracks Büchner’s general story line but focuses on the dilemmas of a contemporary military life. Well done, all. For more news from past MCC fellows/finalist, read Fellows Notes. 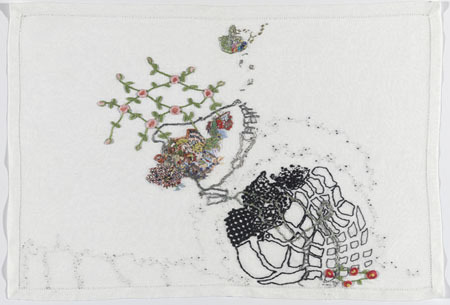 Images: two works by Jan Johnson: CHART OF YOU, ME, THE BABY, THE GUEST AND GOD (2009), Silk and cotton thread on cotton, 16 1/2×11 in; RING AROUND, WE ALL FALL DOWN AND HOW TO GET UP AGAIN (2007), Cotton thread on cotton, 11 1/2×17 in; two works by Nathalie Miebach: BOSTON TIDES (2006), Reed, wood, data, 6x6x2 ft; Detail of WARM WINTER (2007), Reed, wood, data, 6x5x6 ft, both photos taken at Fuller Craft Museum by Karen Mahoney; poster for RESERVOIR by Eric Henry Sanders, produced by The Drilling CompaNY.